After a couple of weeks of watching the rain running down the windows and strong winds flattening the garden plants it seemed that today was going to be the best day of this week for getting out for a walk. Not that there would be blue skies and wall to wall sunshine, but at least it wouldn’t rain, and the winds would be light with the air flow coming up from the south. 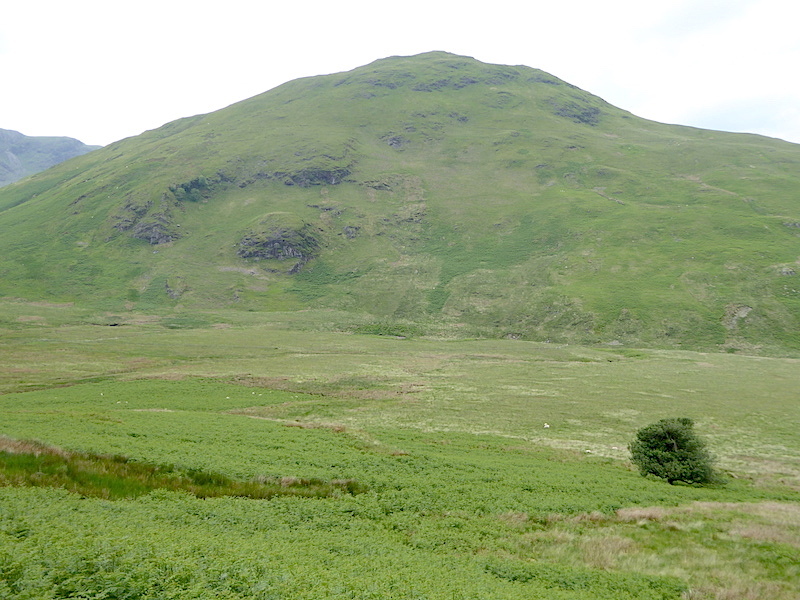 We headed over to Loweswater together with Plan A and, as a contingency measure, a Plan B. In the event we went with Plan B as you will soon see. A note of warning first though – if you have any sort of aversion to the colour green its probably best to look away now because there was an awful lot of it about on today’s walk. 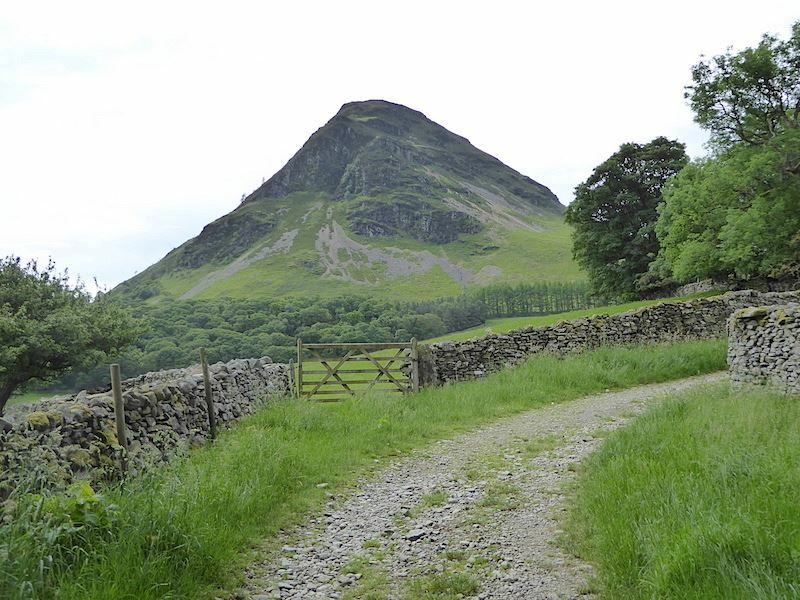 We parked up at Church Bridge, just below the Kirkstile Inn in Loweswater. Its only a small parking area, made even smaller today by the presence of some large puddles and churned up muddy patches, but fortunately no-one else seemed interested in being here today so we were able to park with ease. 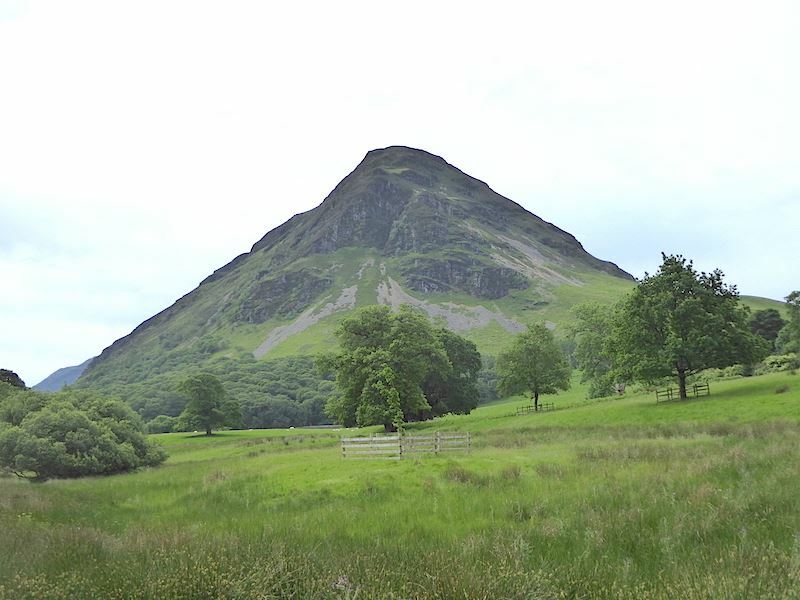 Immediately opposite the parking area is this impressive view of Mellbreak although we had no plans to walk up there today. Once we were kitted up we set off up the farm track still with a view of Mellbreak to keep us company. Its an overcast morning but its warm enough to do without a jacket. Thanks to the overcast skies the light was poor and drained the photos, leaving them all looking rather flat, but that’s something you just have to put up with. If there’s little light the camera can’t magic some in. 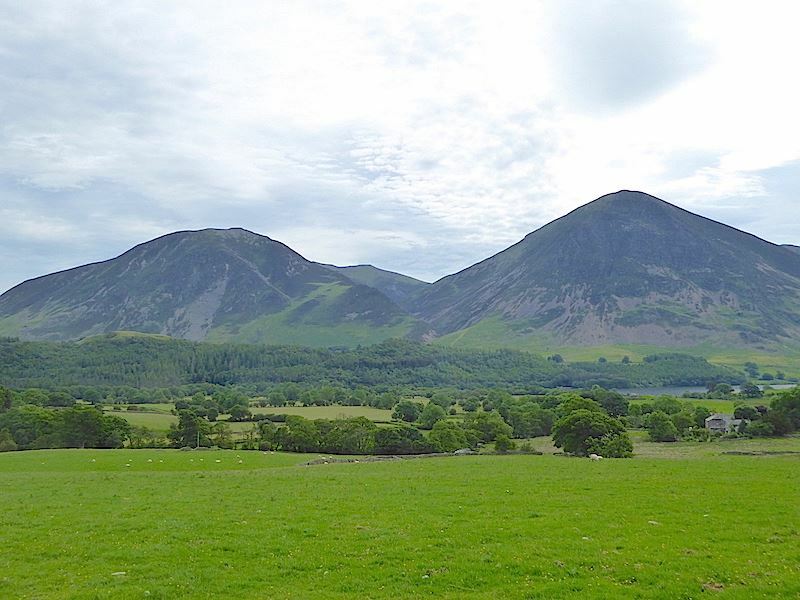 At least the cloud was high so we had this view of Whiteside, on the left, and Grasmoor, to the right, as we walked up the farm track. 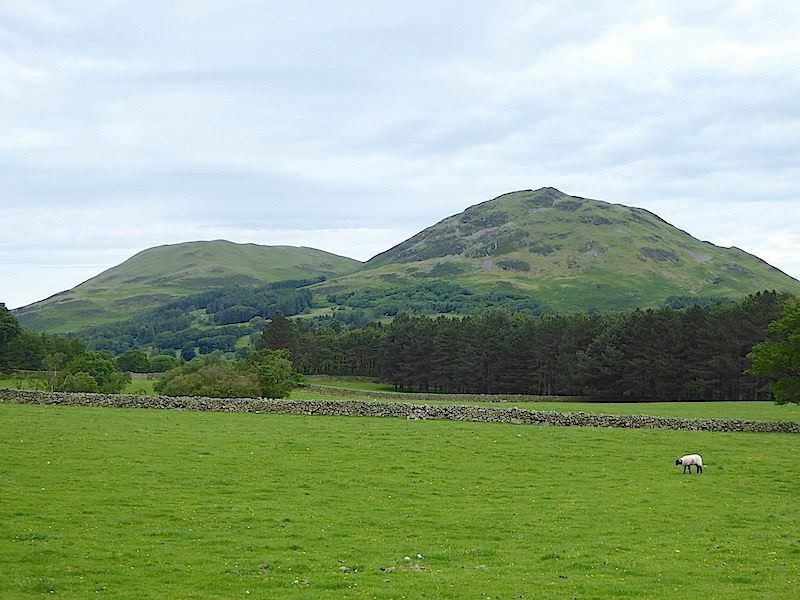 Across the fields on the other side of the farm track are the Loweswater ‘twins’ of Darling Fell and Low Fell, on the left and right respectively. 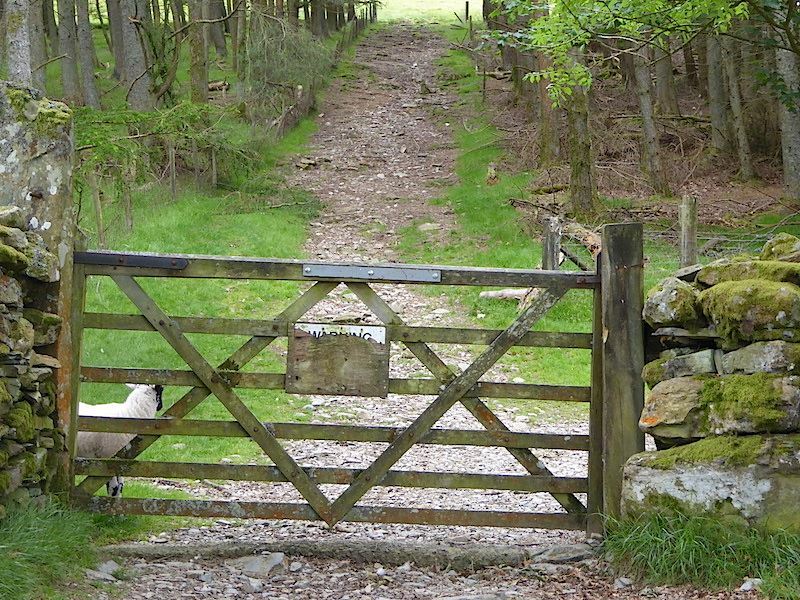 The farm track comes to an end at this gate behind which a lamb was bleating plaintively. As lambs do, it had gone off on its own to do a bit of exploring and now found itself unable to get back to its mother. She was standing in the field on the other side of the fence, which is over to the left of the shot, doing her best to get the lamb out of its predicament and making a whole lot of noise into the bargain. 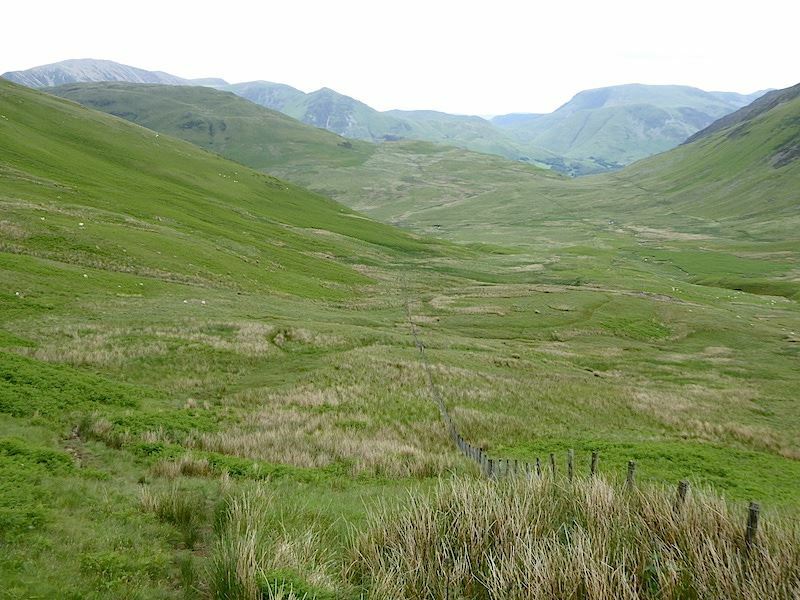 Beyond the gate the track straight ahead leads over to Mellbreak but, as that’s not where we’re going, once through the gate we take the turn to the right …..
….. which leads us onto this bridleway running alongside Mosedale Beck and eventually into Mosedale. 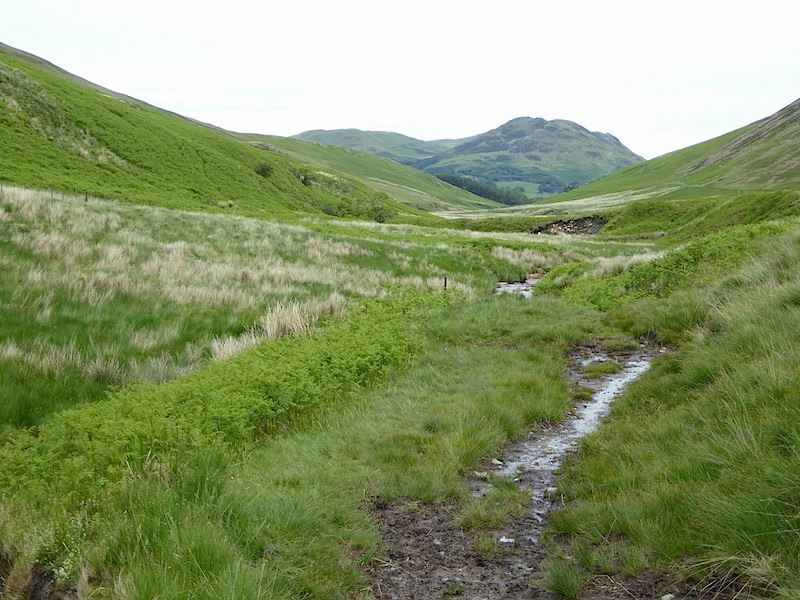 Here we take the little path on the right of the shot and head down to the beck to see if it will be Plan A or Plan B which gets put into operation today. 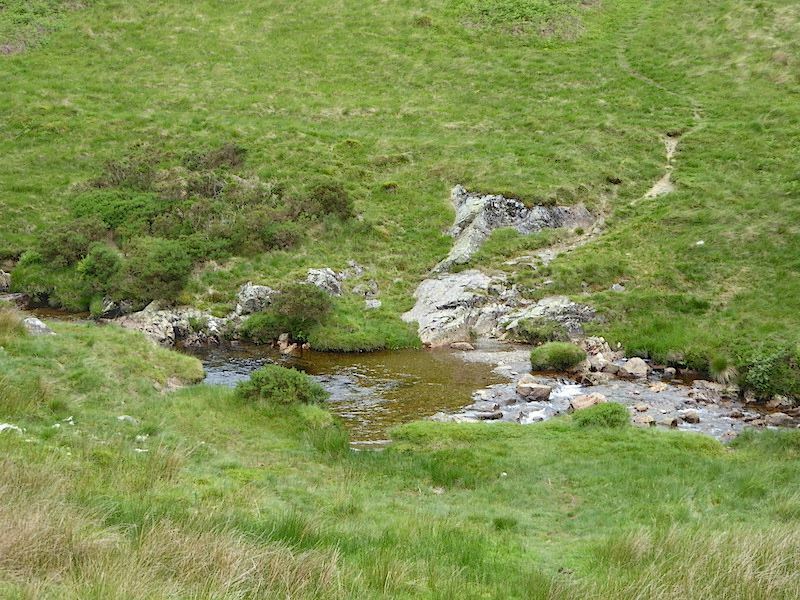 We were hopeful but not confident as we made our way down to the beck crossing …..
….. and our lack of confidence turned out to be justified when we reach the stepping stones. 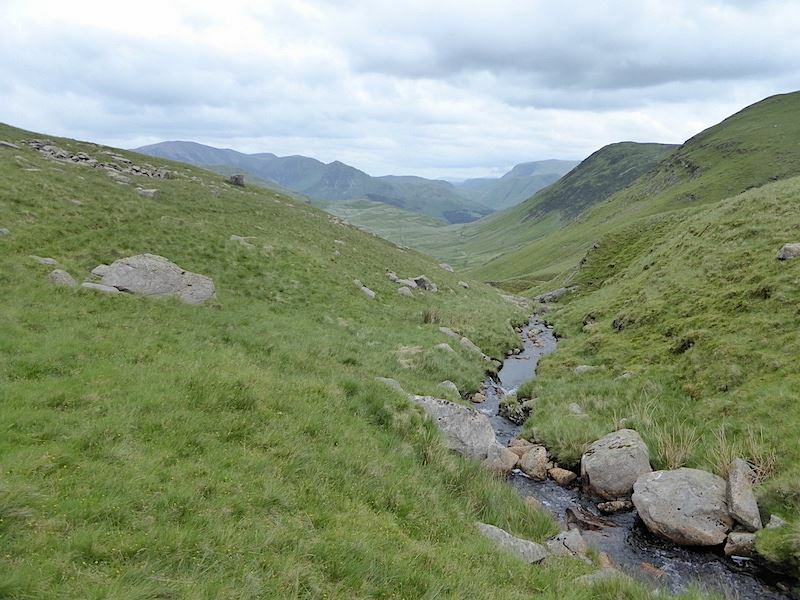 Plan A, to take a walk up Hen Comb, involved crossing this beck using the stepping stones. The recent rains have put paid to that though and the beck was flowing quickly with the middle stones being pretty much below the water level. What remained of them above the water was wet and offering nothing by way of a secure foothold. Now, between the two of us we have one with a gammy foot and the other with a short stride and, as neither of us has any kind of training or skill in the triple jump event, we abandoned the idea of using the stones. 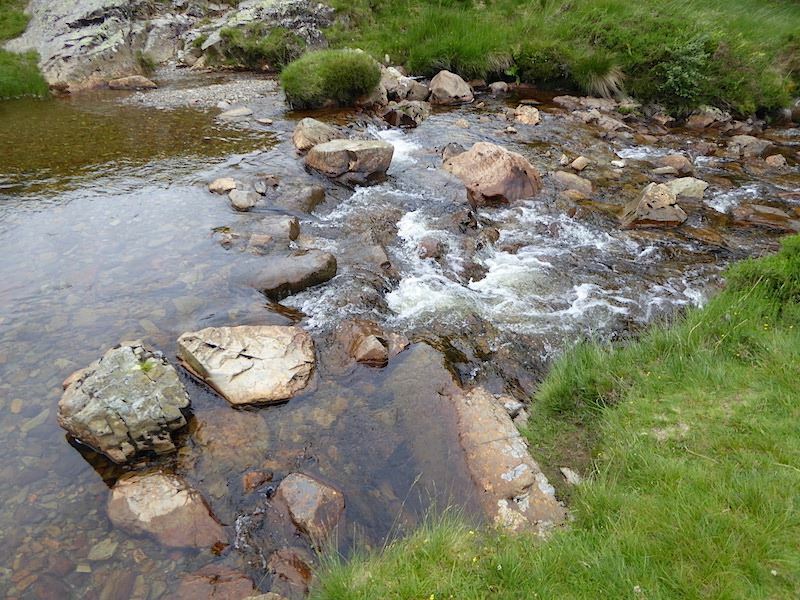 Taking boots and socks off and wading across was a possibility but quickly dismissed, no way did it seem a good idea to consider risking placing a dodgy foot on the wet and uneven stones below the water. One awkward slide followed by one big ‘ouch’ and its owner would be fully immersed and wet through before we’d even got going and that would be end of walk. 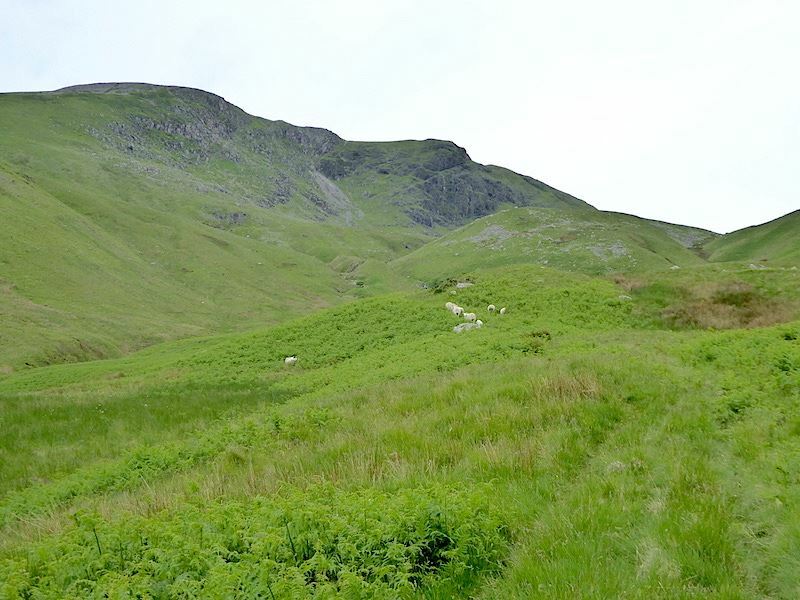 Since we’d suspected we might come up against this little problem we decided it was time for Plan B so it was back up to the main path to continue on into Mosedale and then up to Floutern Tarn. Back on the main path alongside the beck with a view of Hen Comb, where we were going to walk but now aren’t, on the other side. 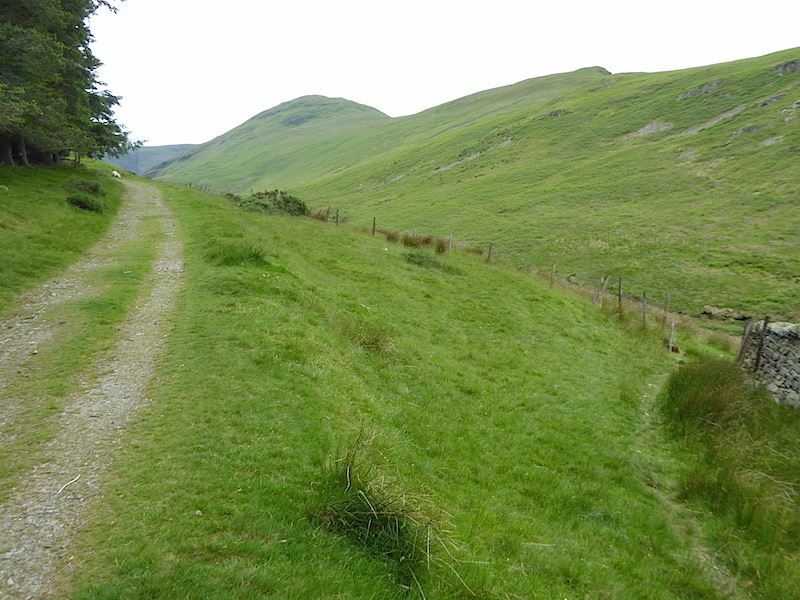 Its a long walk along the valley and the path is firm and easy to follow. By now we were down at t-shirt level, having removed the sweater layer down at the stepping stones, and the walk along here was very pleasant indeed. It wasn’t sunny but it was warm with just enough of a breeze to keep the midges away. Perfect conditions for a walk. Instead of continuing on the main path which passes above the holly tree up ahead, at this point we turn off to the right along the path which will lead us across Mosedale to the path which curves around the foot of Hen Comb. Time to roll up the trouser legs because it will be a splashy walk from now on. The holly tree is unusual in the fact that it is specifically marked on the OS map for this area. 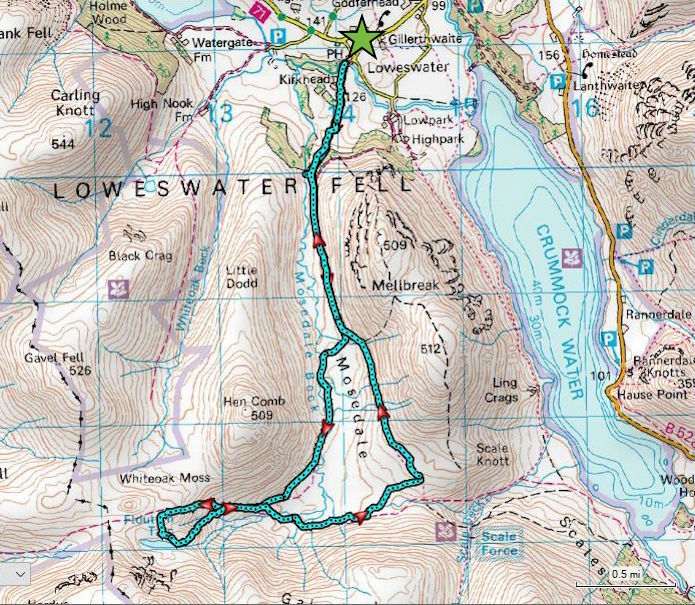 The map on our gps, and from which I produce the route maps, doesn’t show it at all so that seems to be using a slightly different OS map than the paper version. Over on the right some of the fells above Buttermere are beginning to appear, the most prominent at the moment being Red Pike. 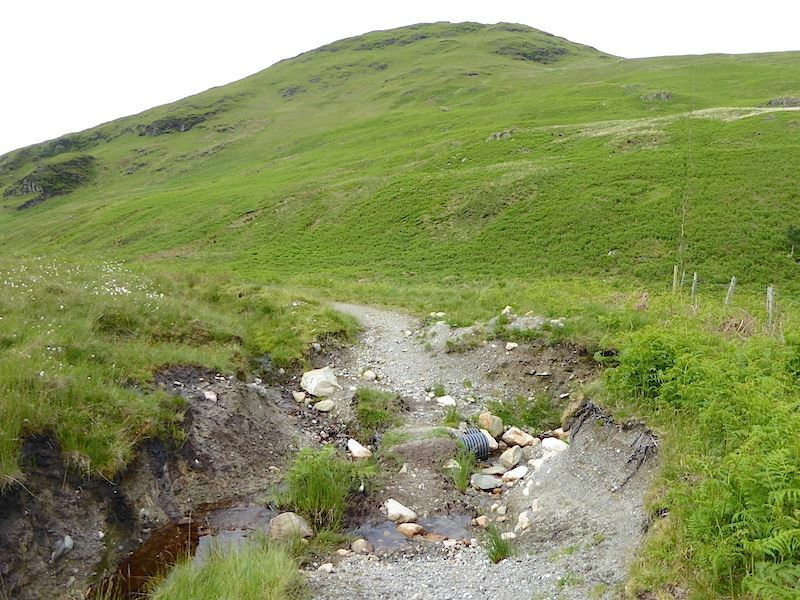 Still splashing our way across over to the Hen Comb side we cross another beck tributary by means of this rudimentary bridge comprised of two sections of large drainpipe covered over with stones and earth. It might not be pretty but it works. 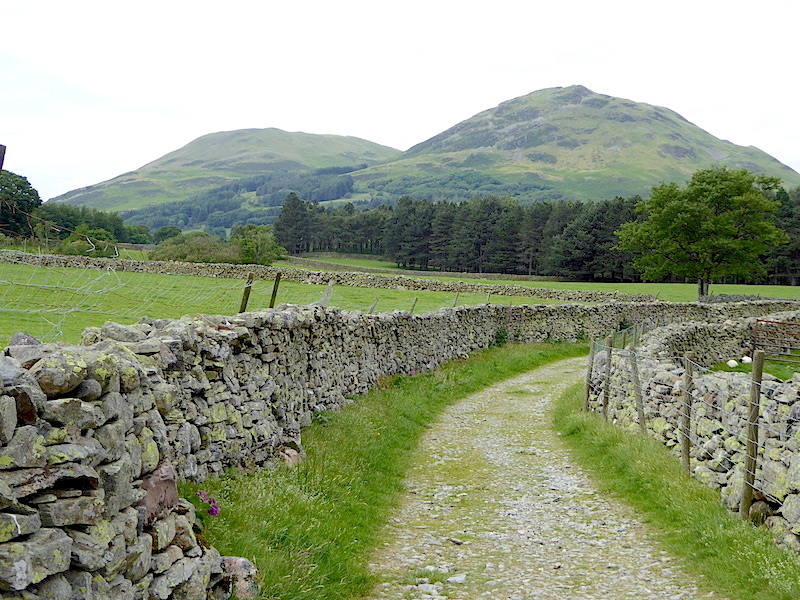 Looking back along the valley to Low Fell as we continue along the watery pathway. 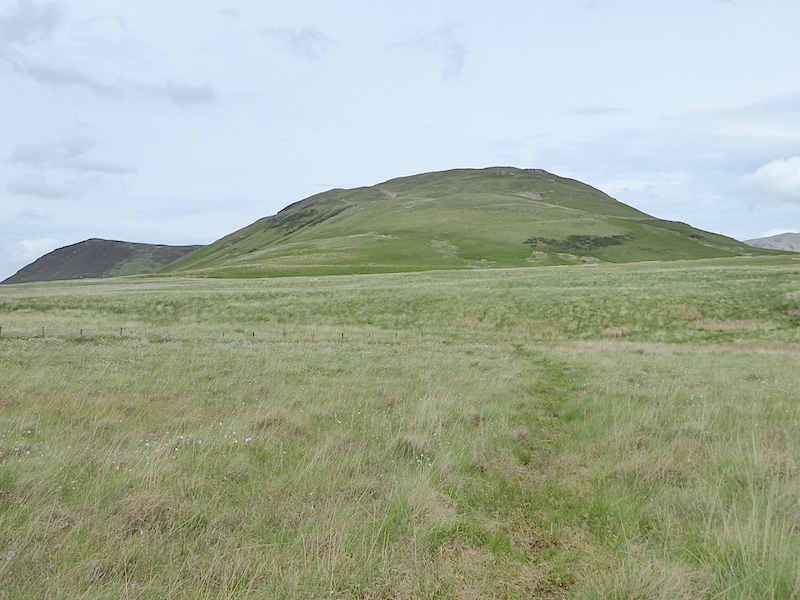 We did lots of side-stepping all the way along to avoid the worst of the wetness, but this is a permanently soggy area so you know you are going to encounter plenty of squelch even when there hasn’t been a lot of rain. After two weeks of the stuff I was surprised to find that it wasn’t as bad as I had thought it would be …..
….. although there were still plenty of puddles about. 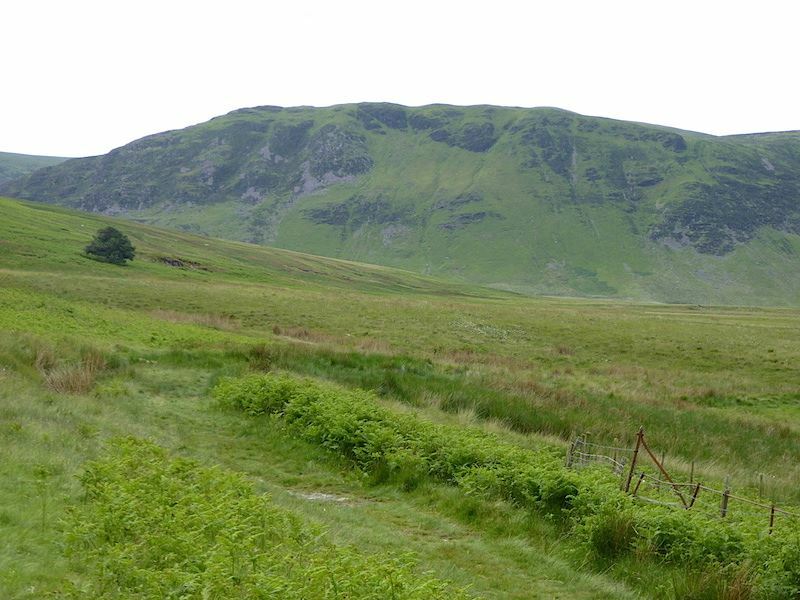 Red Pike is more prominent now over to the left of the crags of Gale Fell. 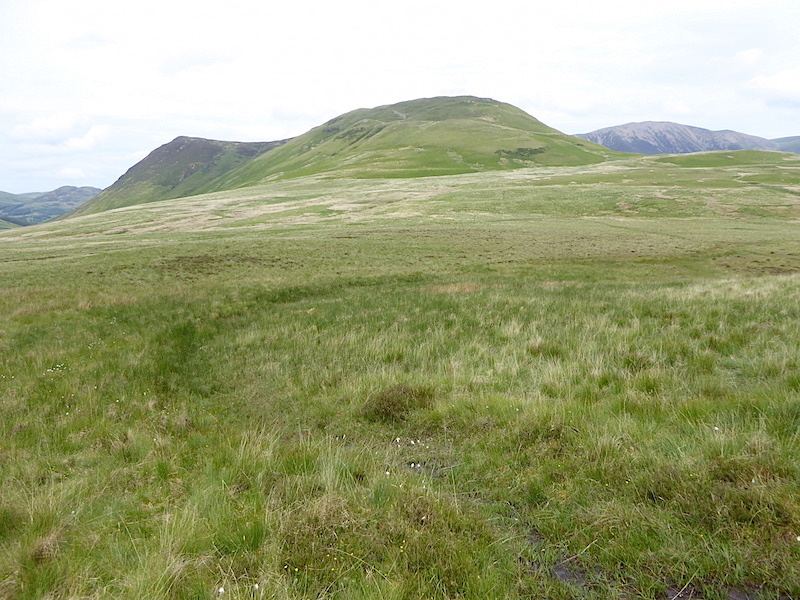 Beyond Gale Fell and out of sight is Starling Dodd. We’re a good way across now so I took a look back for this view of the north top of Mellbreak and the holly tree. You may be wondering why we aren’t just walking straight across the grassy area instead of messing around with squelchy and muddy paths. 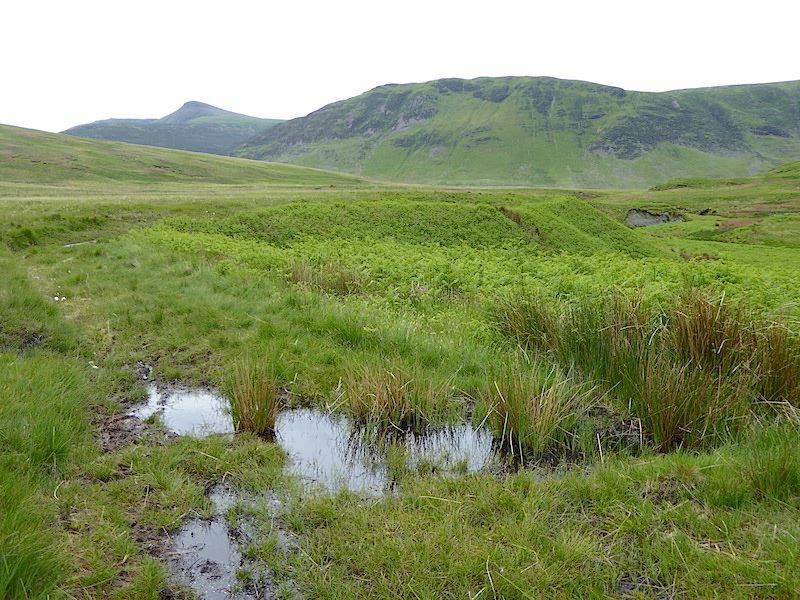 But looks are deceptive and it isn’t a firm field of meadow grass, its a large, flat and very waterlogged expanse of moss and other plants with a deep liking for growing in water. Put a foot in it and you find your boot disappears and the water ends up well above your ankles. 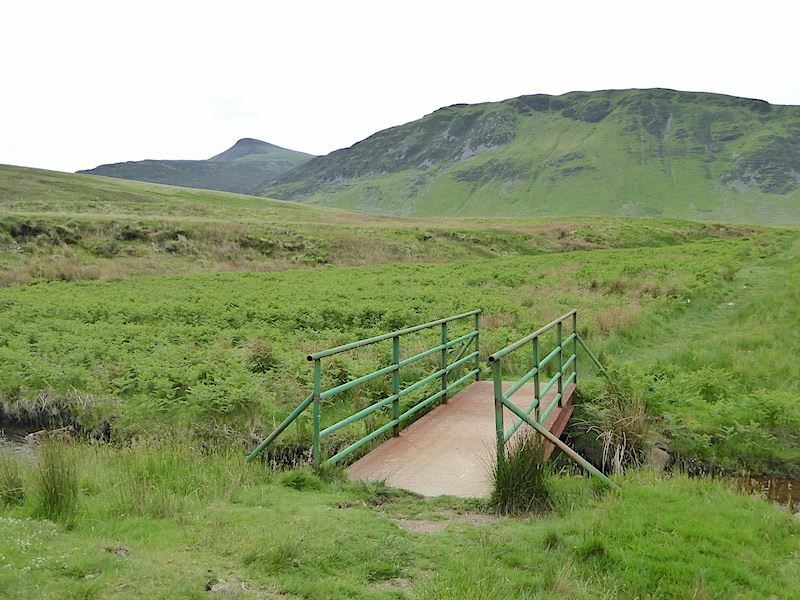 Nearly across to the Hen Comb side …..
….. with just this bridge to cross to get us over the last of our close encounters with the Mosedale Beck for a while. Having reached a slightly drier path on the other side of Mosedale I took a look back along the valley back down towards Mellbreak and Low Fell. 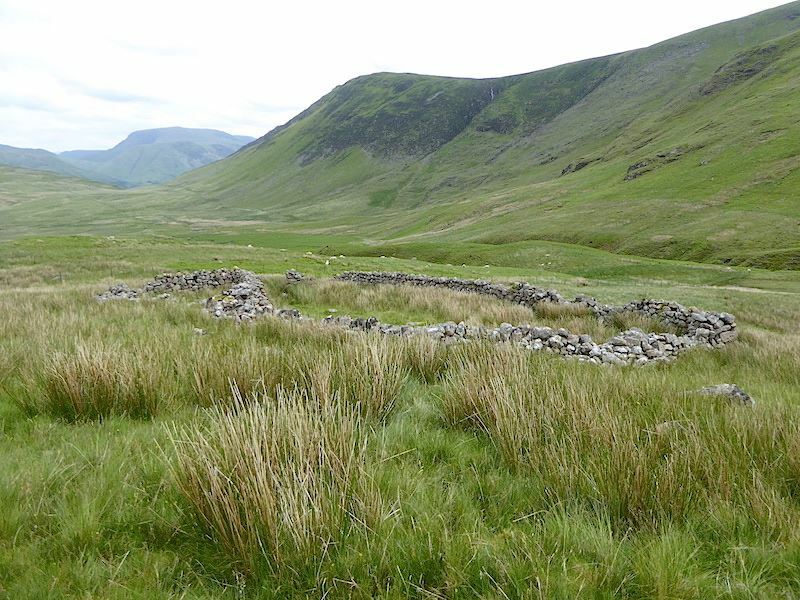 We reached a rocky outcrop with somewhere to sit and, as it was Mars Bar o’clock, decided to stop for a few minutes and take a short break, Below is a derelict sheepfold with the drier path we are using just in front of it. 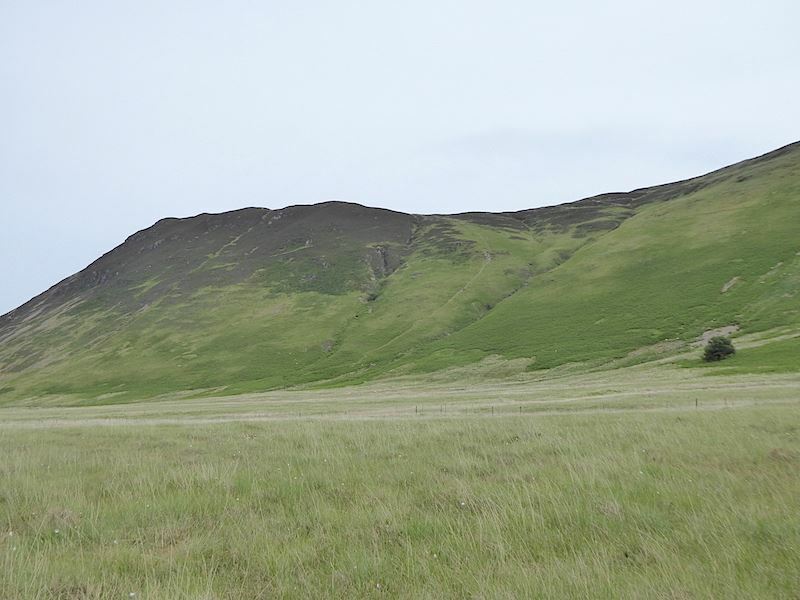 Straight in front of us is the south top of Mellbreak. 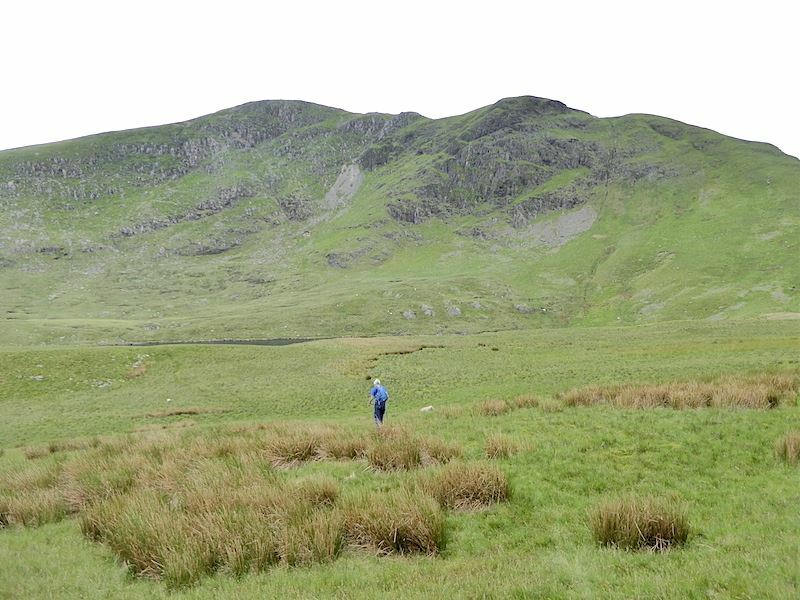 After our break we continue on and begin rounding the southern end of Hen Comb to start the climb up to Floutern Tarn. 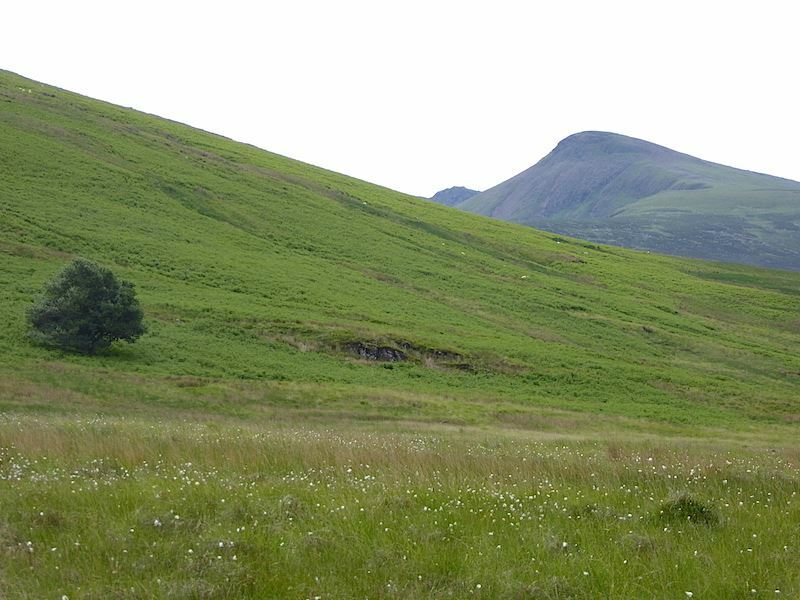 On the centre skyline ahead of us is Great Borne with Floutern Crags below it. The ground is beginning to rise, which is helpful because the ground should become drier. On the other hand it also means that our spell of easy flat walking is coming to an end and the legs will be called upon to put in a lot more effort than they have been doing so far. 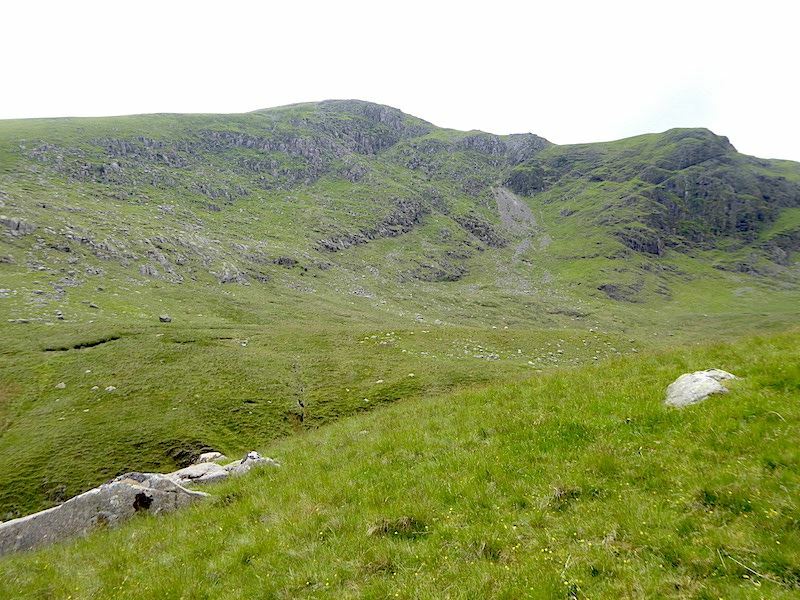 A look back as we stopped for a breather and on the middle left of the shot are the brilliant green lower slopes of Hen Comb which we were rounding a couple of photos back. 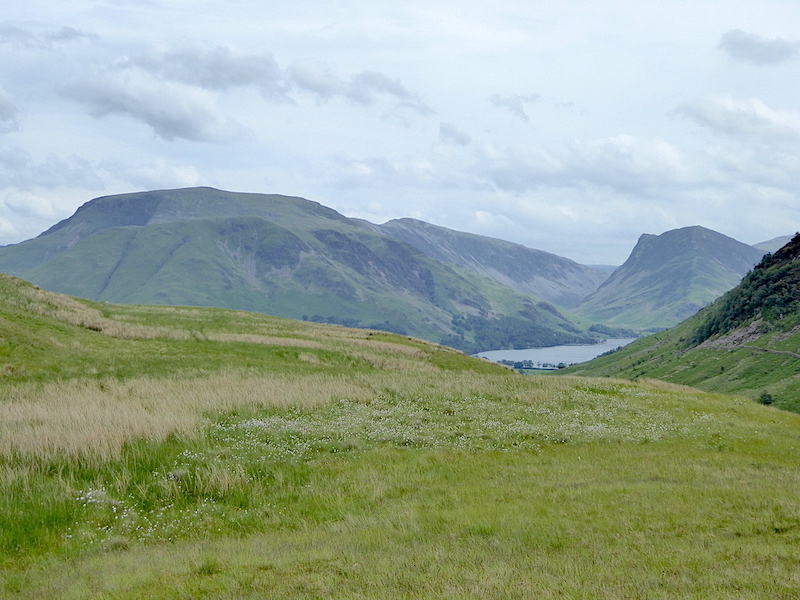 Immediately behind them is the large, flat expanse of Mosedale from where we started the steady climb up to this point. The ground is marginally drier up here but not by much so I suppose that’s down to all the rain we’ve had lately. 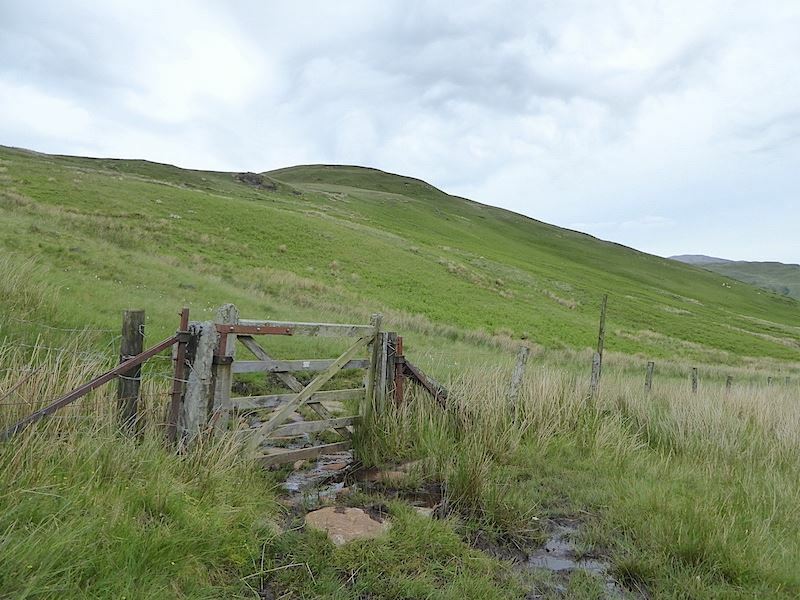 On we go again over the wild, remote and uninhabited terrain with the gradient gradually increasing …..
….. up to this gate. Through the gate we turn sharp left and then the gradient becomes much steeper. 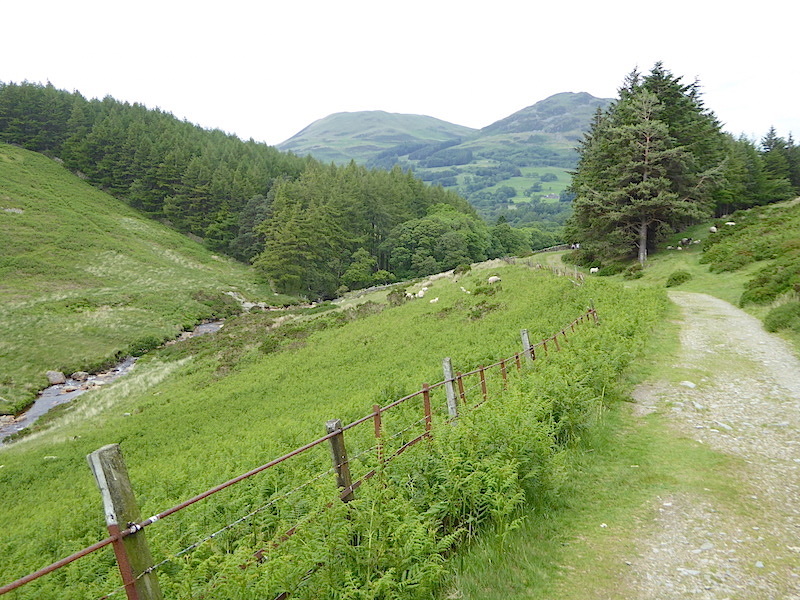 The path up the steep incline more or less follows the fence line and, as we pause for yet another lungful of air, I took another look back at the route we have been taking. Its not an overly hot day but it is now very close and muggy, the cloud has thickened up and this is starting to be very warm work indeed. 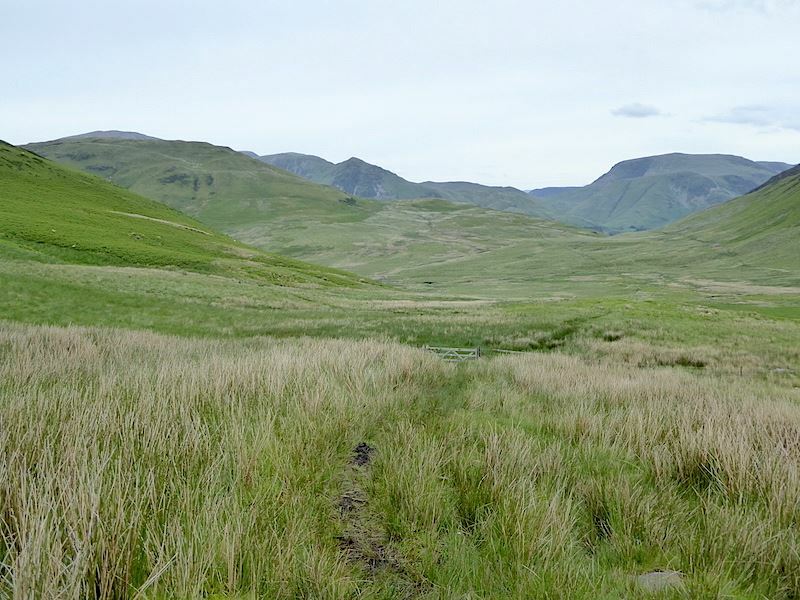 The view from the stile towards Floutern Crags as we make our way down to the tarn. 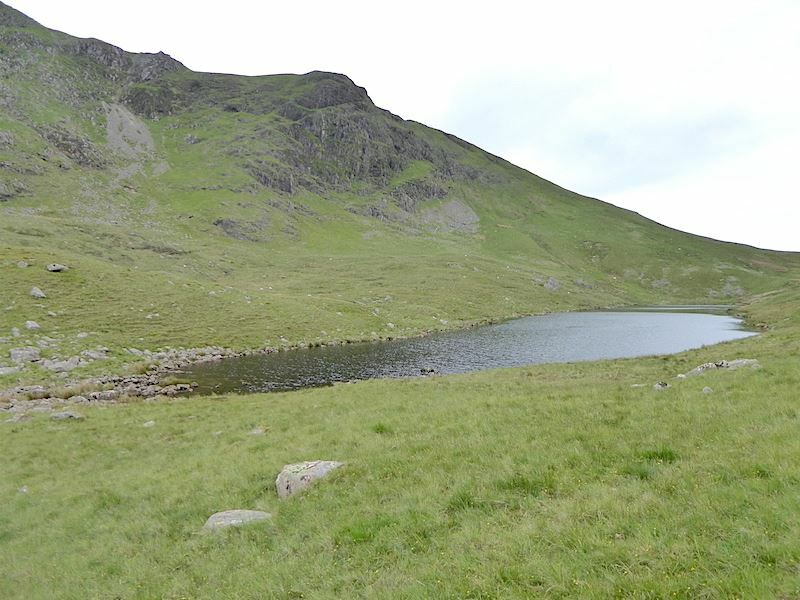 The remote Floutern Tarn with Floutern Cop beyond it in the distance. 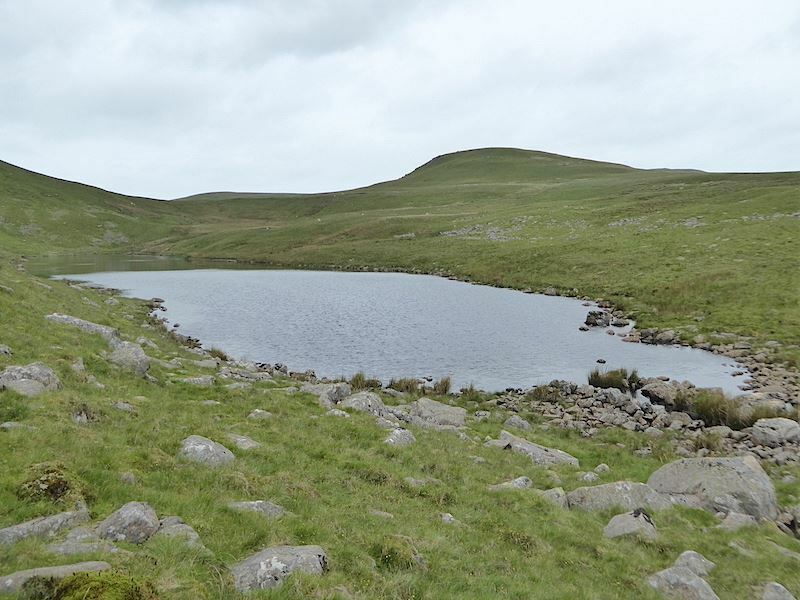 The tarn is not the usual round mountain tarn but has an elongated shape, and we’re not seeing at its best today thanks to the cloud cover which has been thickening considerably all morning. 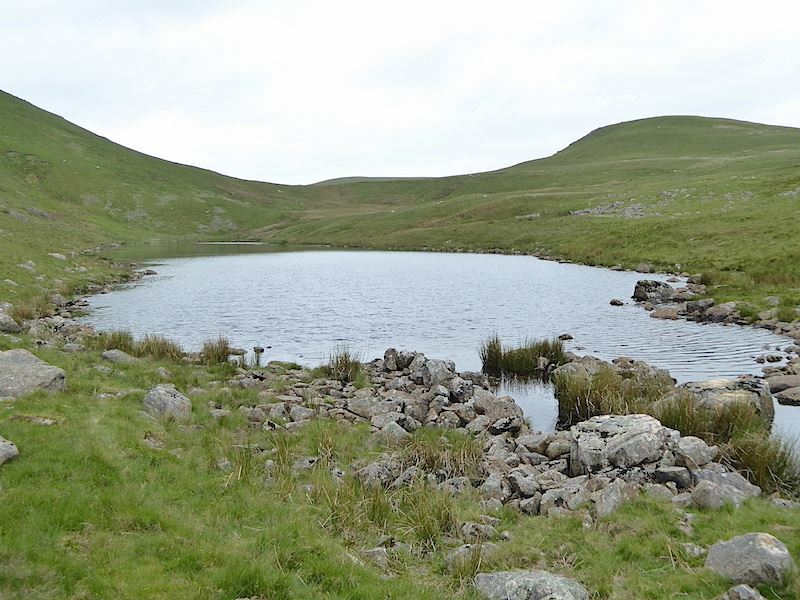 We had a coffee and sandwiches break at the tarn before making our way back down again. 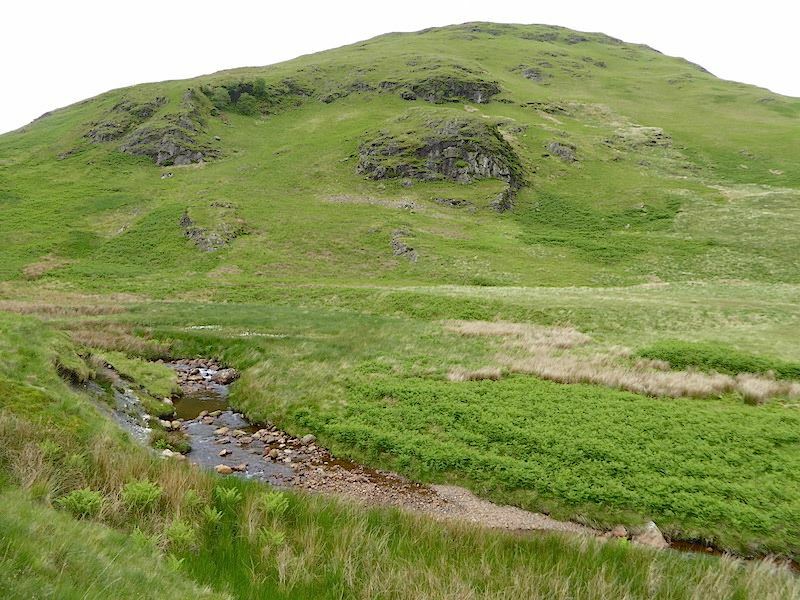 This beck flows out of the tarn and makes its way down, eventually joining up the rest of the becks flowing down the sides of Gale Fell and ultimately all becoming one in the form of Mosedale Beck. 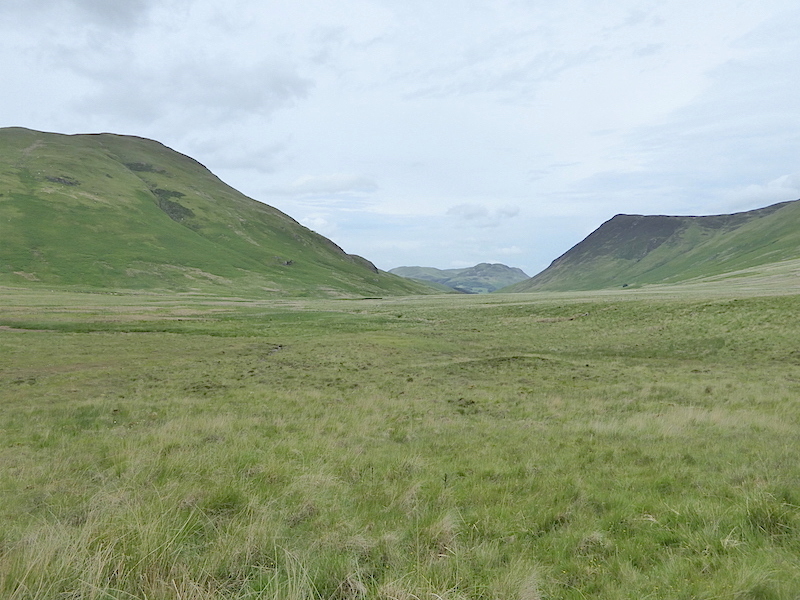 The elongated form of Floutern Tarn nestling below Floutern Crags, with Steel Brow, the northern ridge of Great Borne, beyond it. 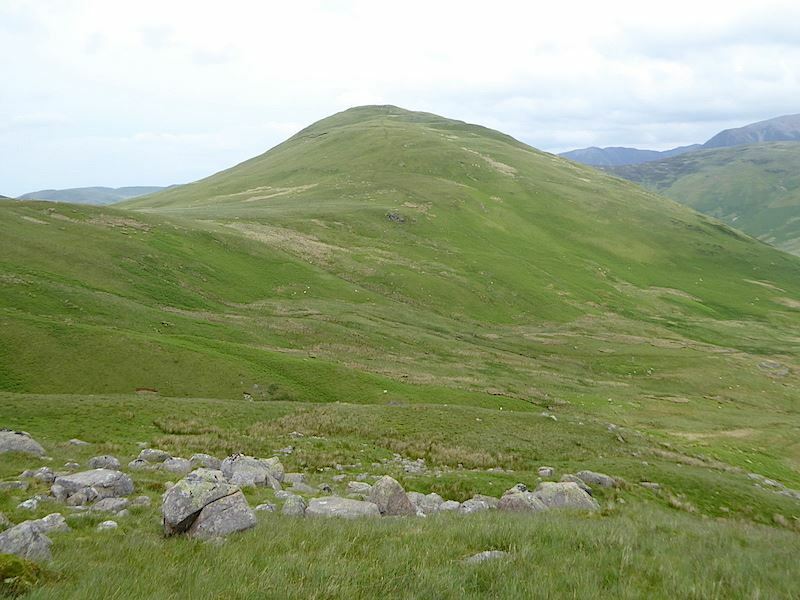 A view of Hen Comb from the descent. 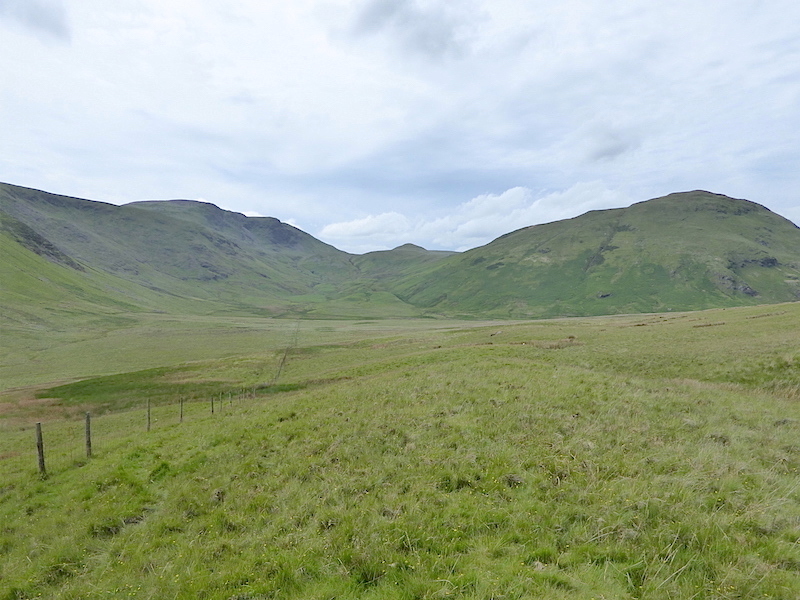 It would have been possible to go over to the summit from the stile on the Floutern Pass and we did consider it while we took a break at the tarn but decided to stick to our Plan B and leave Hen Comb for another day. By the way, that’s not blue sky up there its just another shade of light grey. 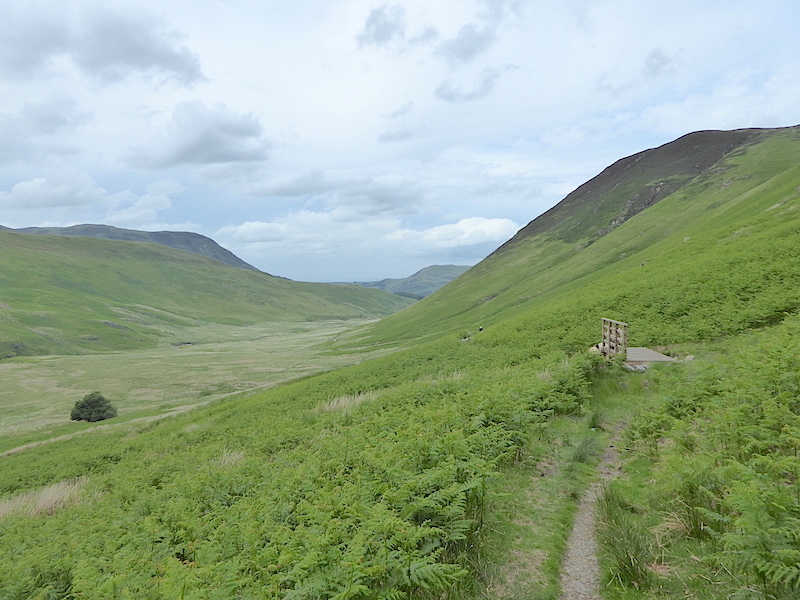 The view down into Mosedale with a panorama of fells on the skyline. 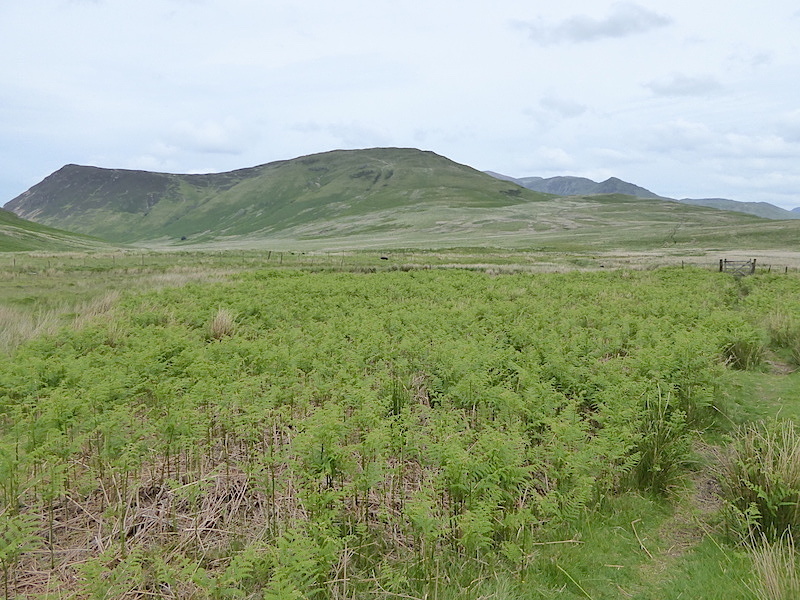 They’re all a bit hazy but the most prominent ones are Grasmoor, just left of centre, the pointy top of Whiteless Pike and over on the far right is Robinson. I’m glad we didn’t go looking for views today because there wasn’t much on offer and I’d only have ended up grumbling about it! From the same little hilltop I swung the camera to my right for a shot of Red Gill cutting a deep chasm through the slopes of Great Borne …..
….. and then a look behind me again at Great Borne and Floutern Crags. A close up of the first person we have seen today. 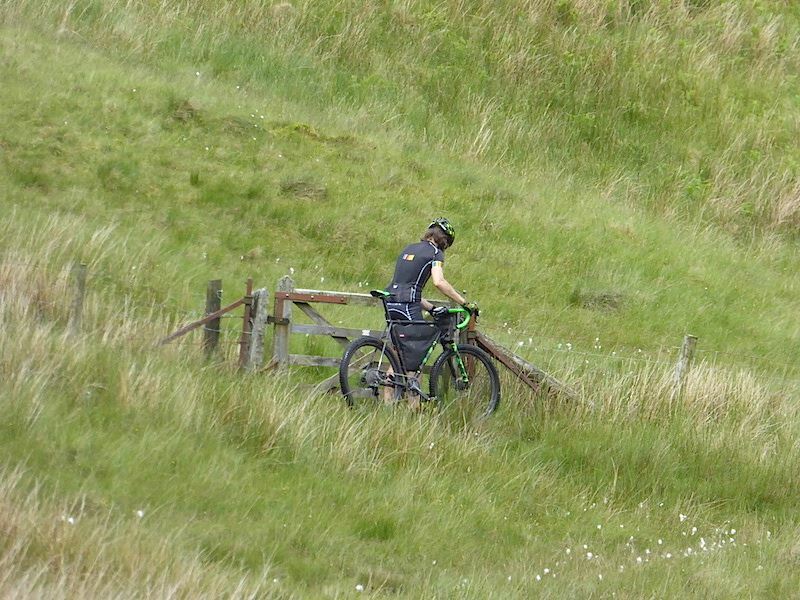 A lone cyclist pedalling hard up the soft and juicy path and much too far away to exchange greetings with. At the gate it was a bit of a struggle to get it open and get bike and rider through while battling through the watery, soggy mess that seems to gather around all gates and stiles. 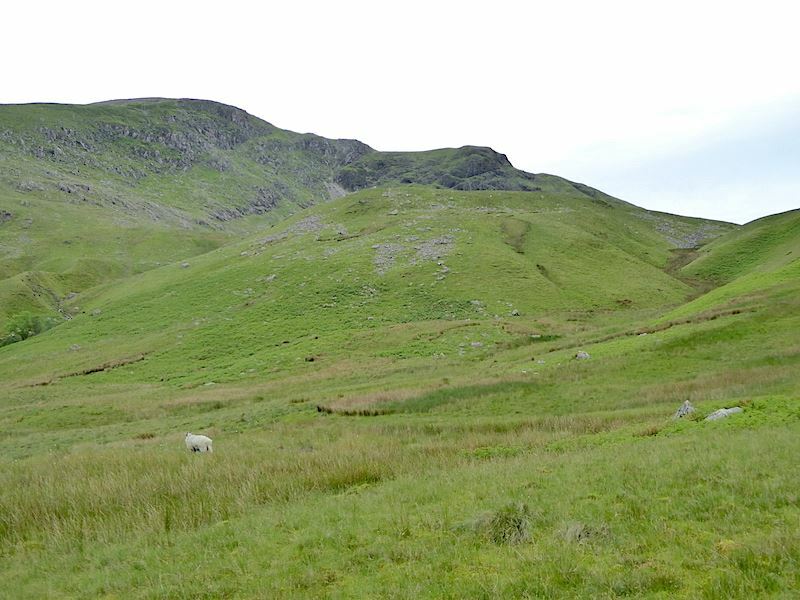 Back at one of the many sheepfolds in the area and more or less back down on flat ground. 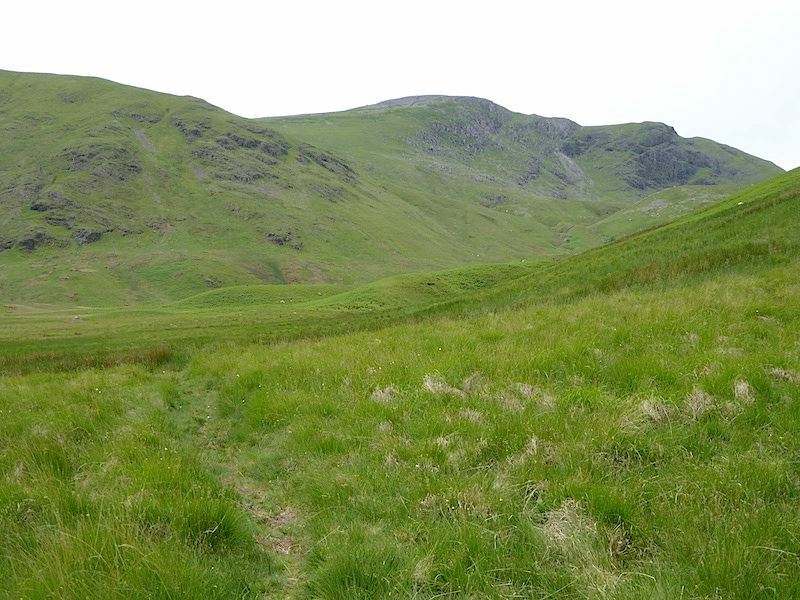 So far we have retraced our outward steps but at this point we veer over to the right to pick up the path which runs below the slopes of Gale Fell. 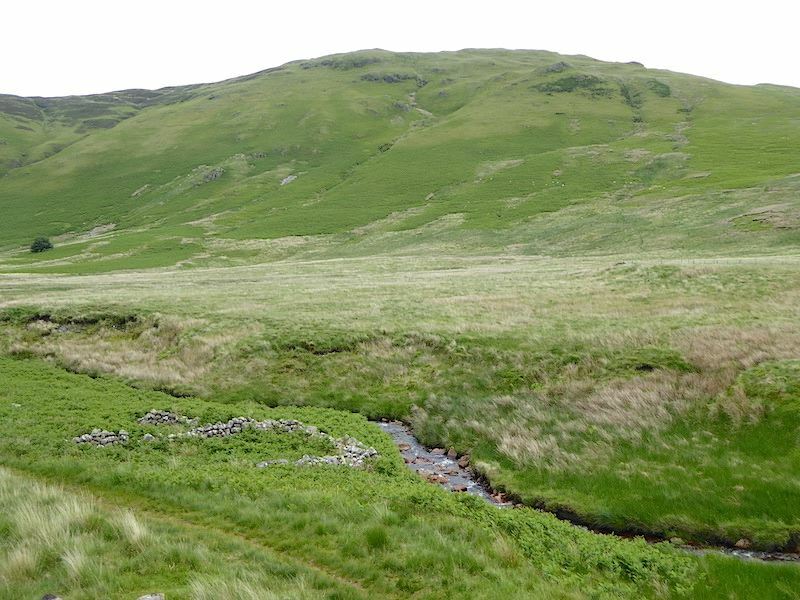 On the crossing over to the path below Gale Fell we had to negotiate several small becks, all of which contained plenty of water and which covered any stones which could have been used in the crossing. At most of them we had to resort to finding a narrow point where it was possible to stride or make a small leap over. 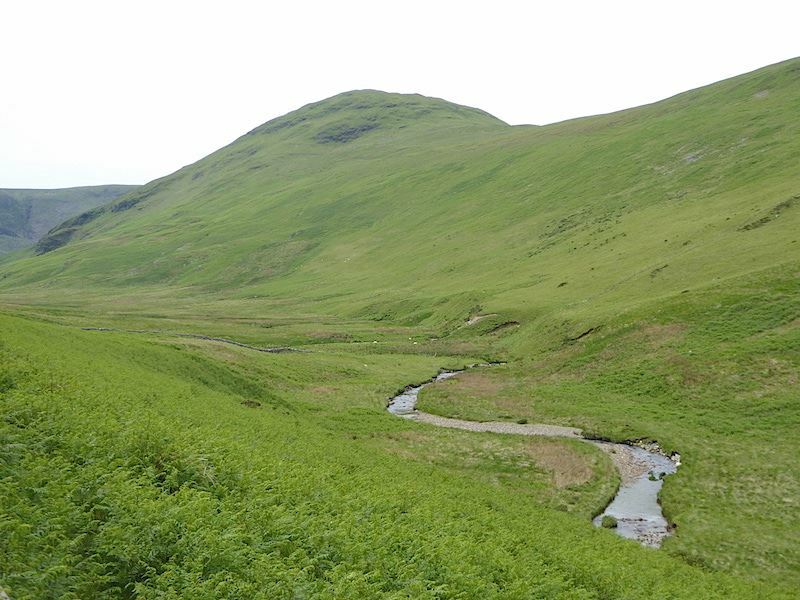 Smack in the centre of the photo is a gate before which was another such crossing, the section of beck just before the gate being far too wide to stride or leap. 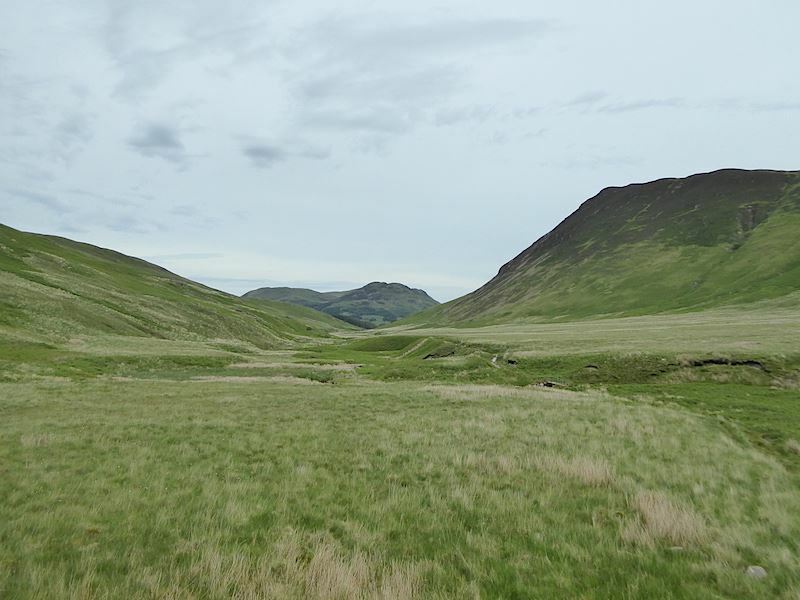 We gain the path below Gale Fell and begin our walk around the head of Mosedale where we have the whole of Mellbreak with its two distinct tops in view. 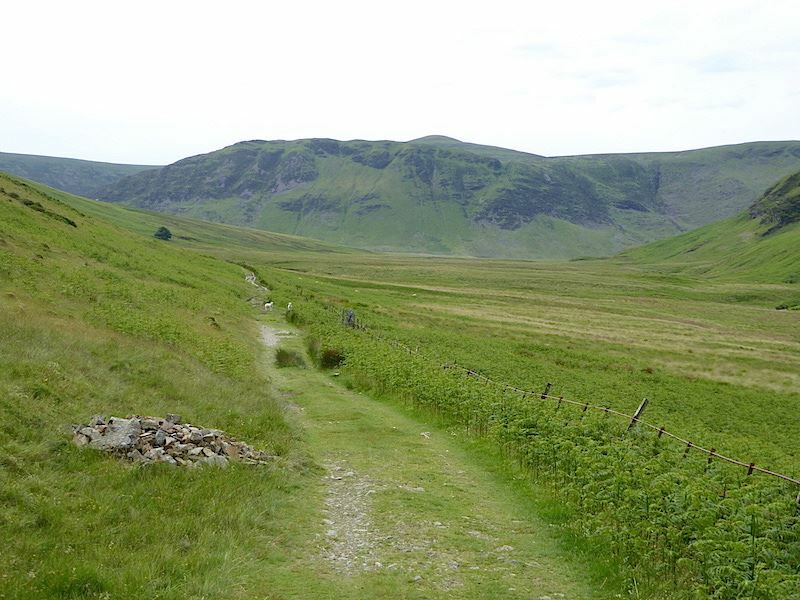 The path may look dry but it wasn’t, having said that though, it was better than the path across to and around Hen Comb earlier on. 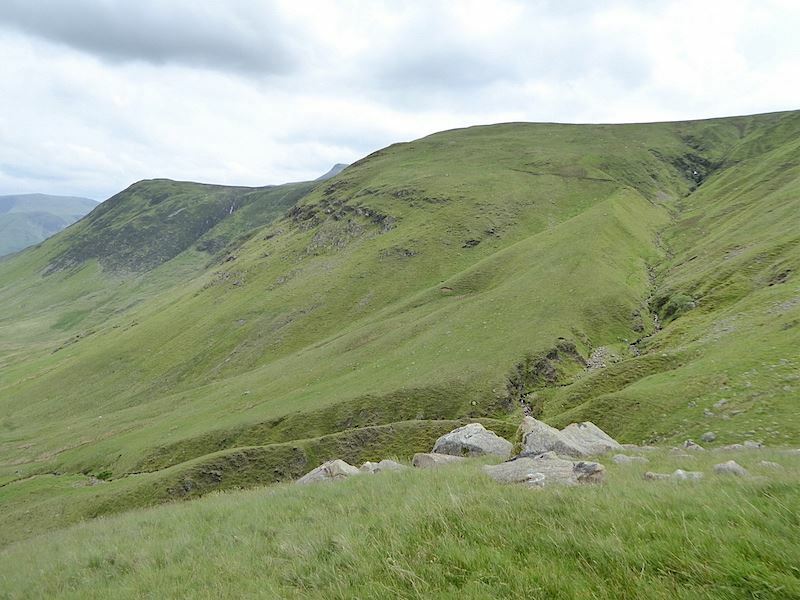 At this point we left the path below Gale Fell and followed the splashy trail which would take us over to the Mellbreak side of Mosedale. Its a straightforward route and easy to follow but much wetter than the one we had left, and that one was by no means dry. Although the ground was relatively flat the effort of pulling feet out of the squelch was very tiring and soon had the leg muscles threatening industrial action. Think of walking over soft sand or soft snow and you’ll be on the right lines since the effect is much the same. 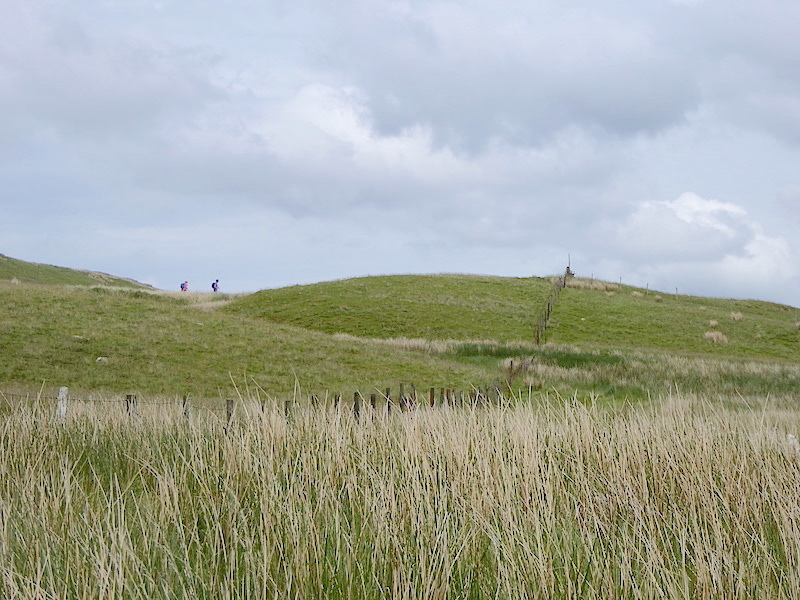 A pair of walkers appear on the skyline as we make for the stile, and some dry ground at last, at the top of the little hill ahead. So that’s three people we have seen today, its beginning to feel crowded! 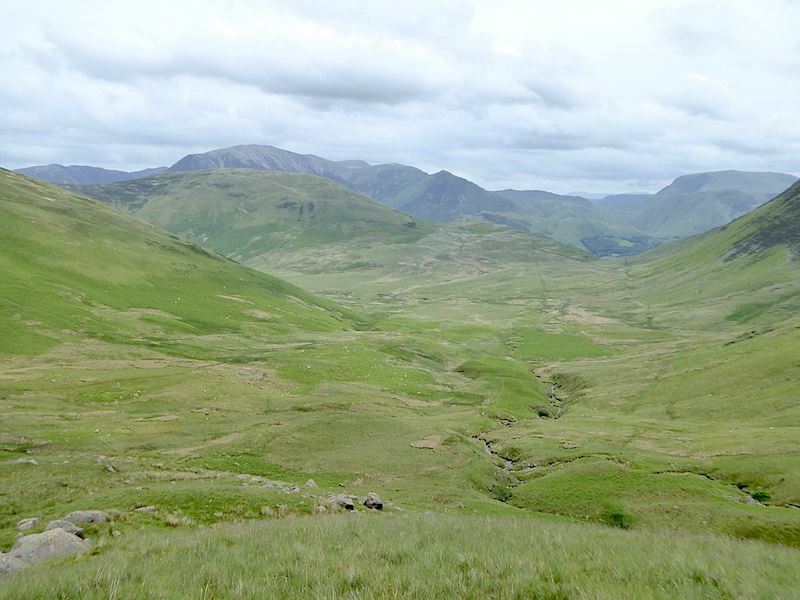 A short stop for drinks at the stile gave me the chance to take a look back at Floutern Cop, on the centre skyline, and our route down from the tarn. 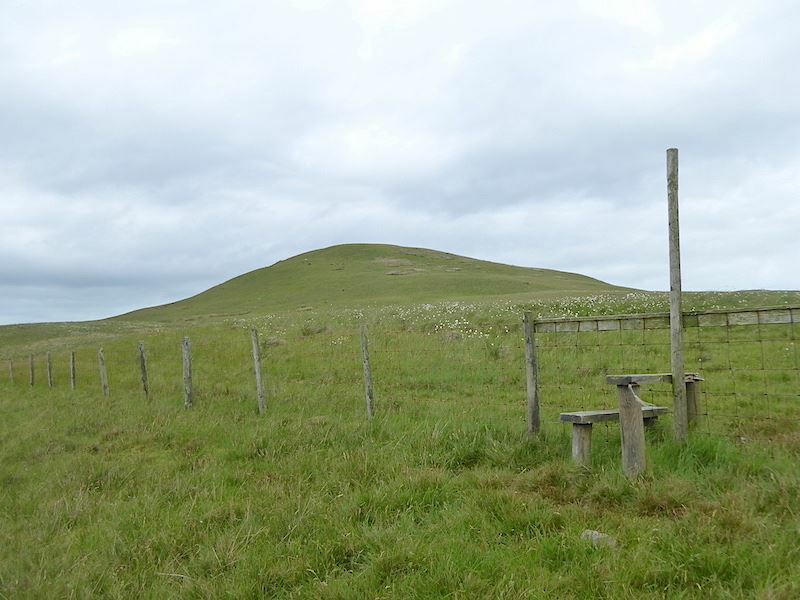 The aforementioned stile plus gate, neither of which we had to use since we approached then from the unenclosed route to the right of the fence line. 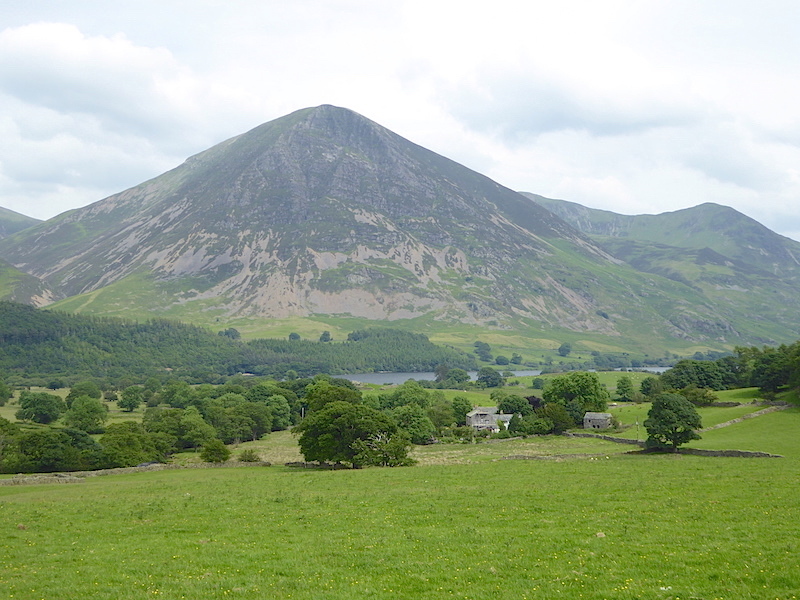 Robinson, Dale Head and Fleetwith Pike are showing over on the left skyline, with Red Pike just peeping over the top of Gale Fell on the right. Robinson, Dale Head and Fleetwith Pike again with just a little smidge of Buttermere showing below them, with a very dull and sullen sky overhead. We’re on the homeward stretch now as we walk along the path running below Mellbreak with the holly tree back in view. If you zoom in you might be able to pick out, slightly to the left of the bridge, a walker in dark clothing and wearing a white hat, heading towards us. When we met we had a bit of a chat and it turned out that he lived in Orton, near Tebay, a mere 12 miles from where we live in the Eden Valley. 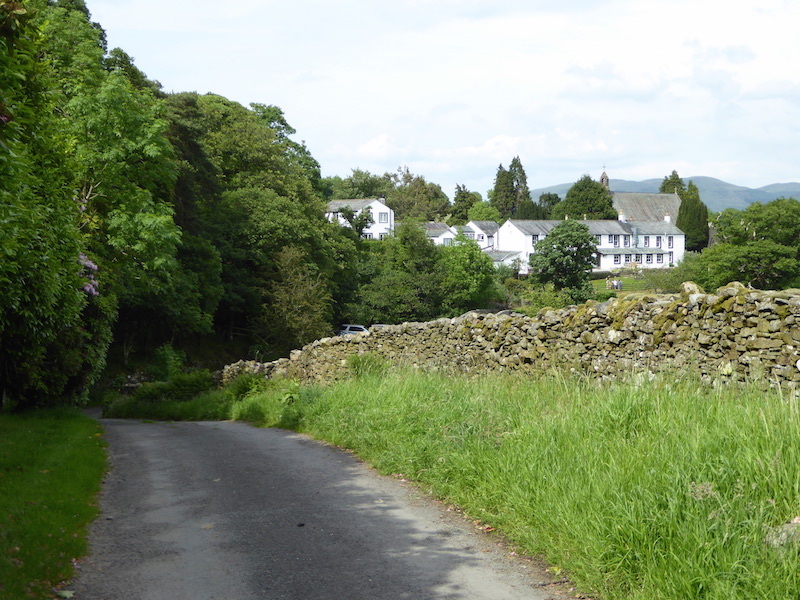 In Lake District terms that practically makes us next door neighbours. Like us he wasn’t a native Cumbrian though, and part way through our natter he said “A yer fra Yorkshire then?” (Teks one ter naw one, dunt it?) Mind you, given that my accent is more Skipton than Sloane Square it wouldn’t take a genius to work out where I’m from originally, same goes for J, he’s Yorkshire too but he doesn’t hail from Skipton. It was a good natter with a fellow tyke, a very jolly and friendly chap. 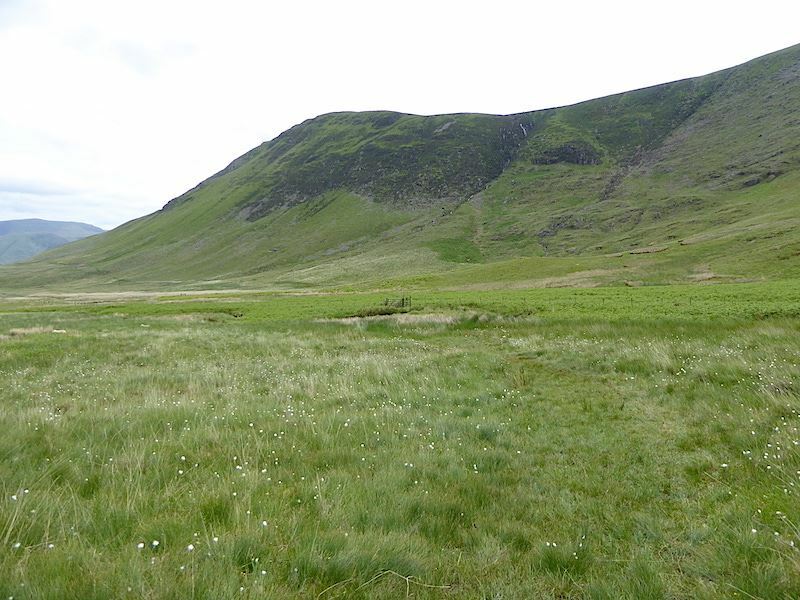 Another look at Hen Comb across Mosedale as we carry on back to Loweswater. The firm and dry bridleway helps us make good time and before long we are back at the beck crossing still with the same grey skies that we had this morning. When we got back down to the gate there were now two loose lambs bleating and trying to find their way back into the field. 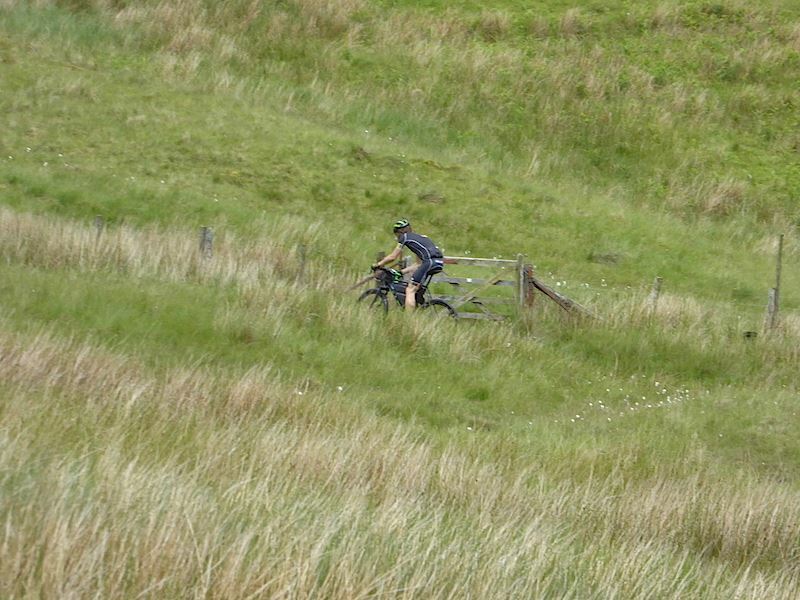 We left them to it and passed through the gate and back on to the farm track. 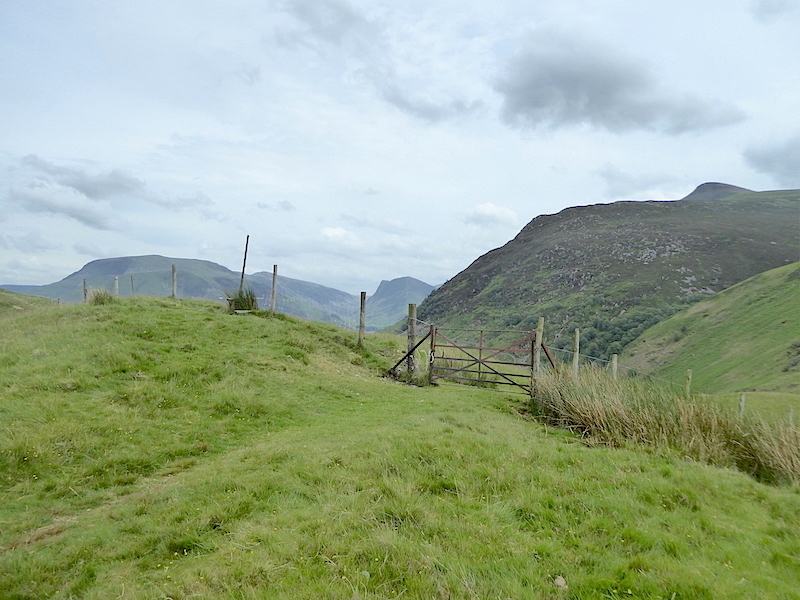 The view of Whiteside and Grasmoor from the farm track. Just a little bit of sun would have been a great help in making the whole scene look just a little less dour. 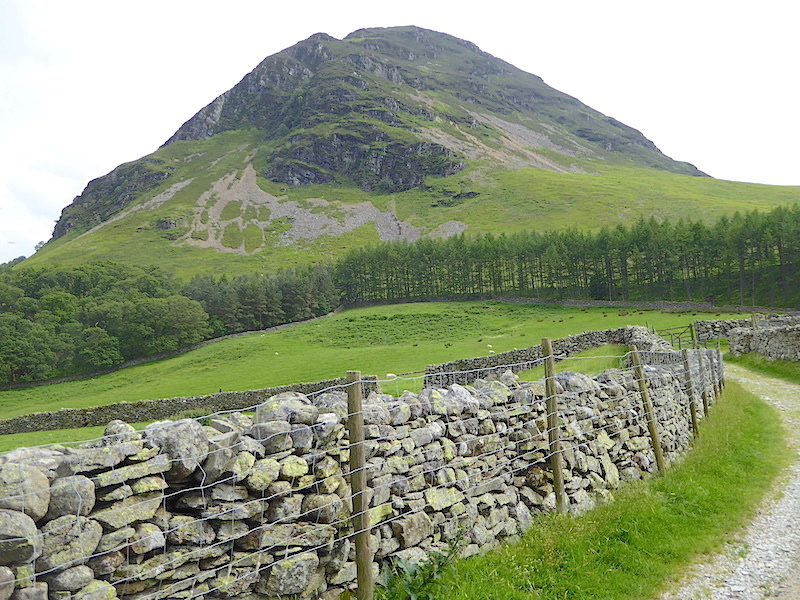 Similarly for the Loweswater ‘twins ahead of us. 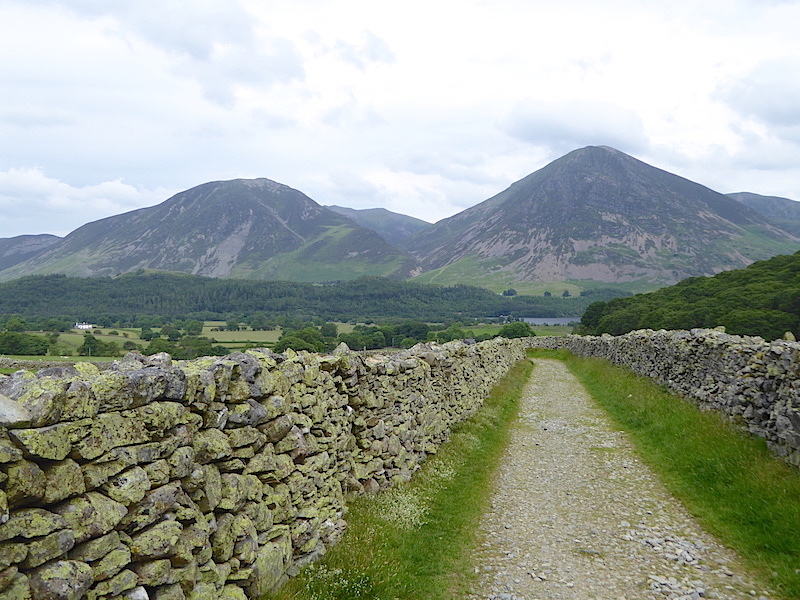 A shot of Mellbreak as we enter the home straight …..
….. and one of Grasmoor across the valley. As we reached Kirkgate Farm, a couple of hundred yards away from the car park, the sun decided to put in an appearance. At last some illumination. 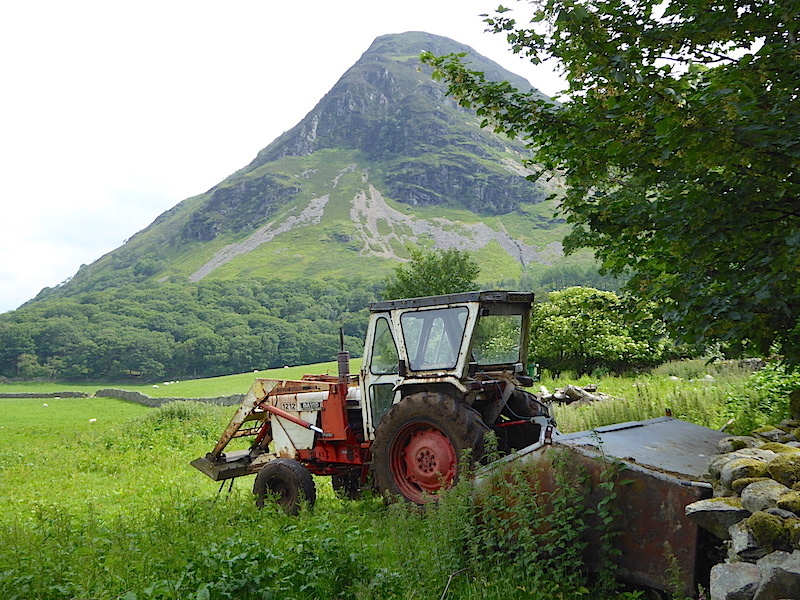 For any tractor enthusiasts out there here’s a shot of the farm’s David Brown 1212 tractor dating from the mid 1970’s, but there was a much newer tractor parked at the farm, so perhaps this one has been put out to grass. We are a couple of minutes away from the car, in fact you can see the roof of it just above the wall, and the end of our walk when the sun comes out and the whole day changes completely. The grey clouds have melted away, as if by magic, to be replaced by fluffy white ones and blue sky, and the Kirkstile Inn is basking in the sun, as are the patrons in the pub gardens. Right this minute I could spit nails!